Maybe I was feelin’ guilty for missing that motorcycle auction last weekend, or maybe it was the siren song(?) 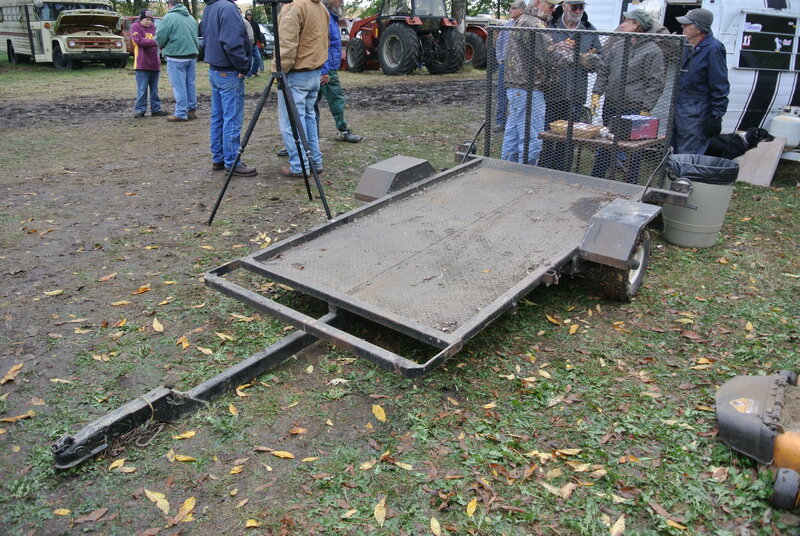 of that old Kubota or the pair of IH Cubs… But I wasted another perfectly good day at an auction. $500?! No title and questionable tires… You can buy a brand new one from Teske’s just down the road for less! 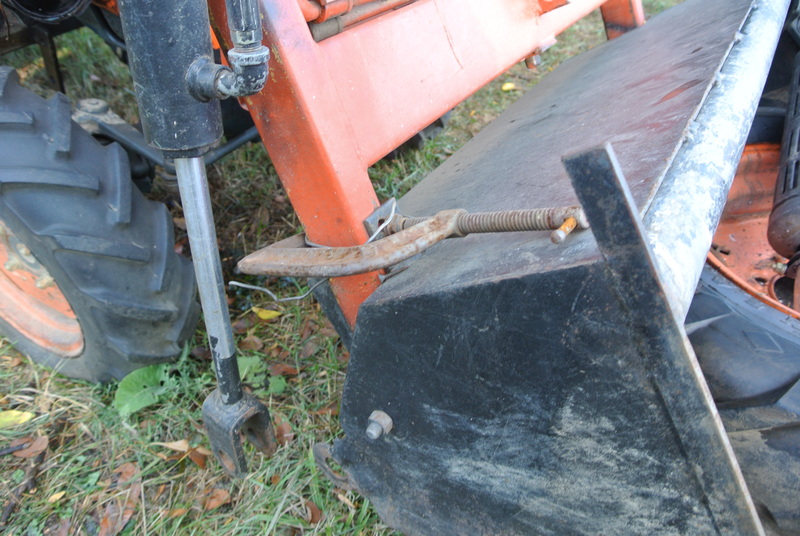 A vintage C clamp holding the bucket in place, note limp cylinder in the background. Had another C clamp on the forward/reverse lever, and bodges like this all over. Turned over, but wouldn’t start, even with ether. 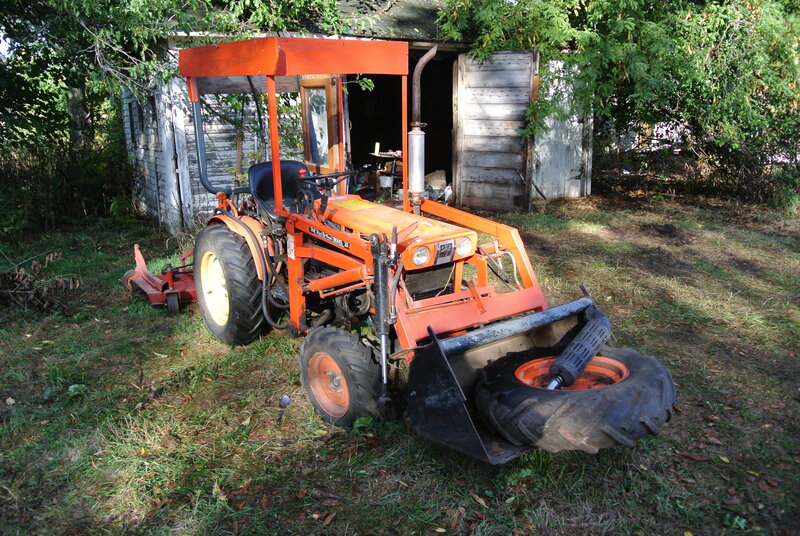 You can buy a brand new baby tractor like this with a warranty for $10k, and the loader don’t count ’cause it’s bucket is too narrow besides bein’ busted. Using the usual formula for a decade or more machine bein’ worth 10-20% of the price of a new one, and half that if it don’t run… I set my limit at $1000. That’s where the bidding started, and it sold for $2000. 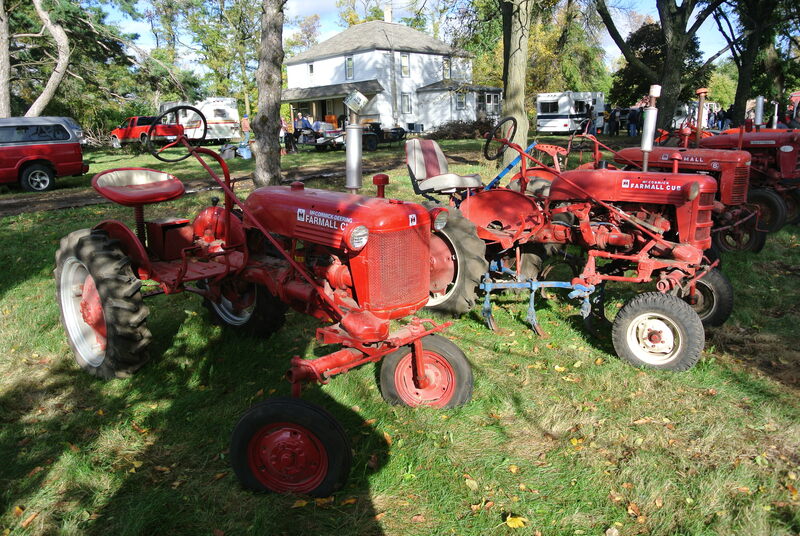 Pair of at least 4 decades old IH Cubs, around 15 HP rear wheel drive (but not much), oddball PTO speed, neither ran, and the one in the foreground is missing the carb and who knows what else, neither had batteries. $500 tops by my figurin’, the sorta complete one went for $1000 and the uncarbed one for $1400!!!
! 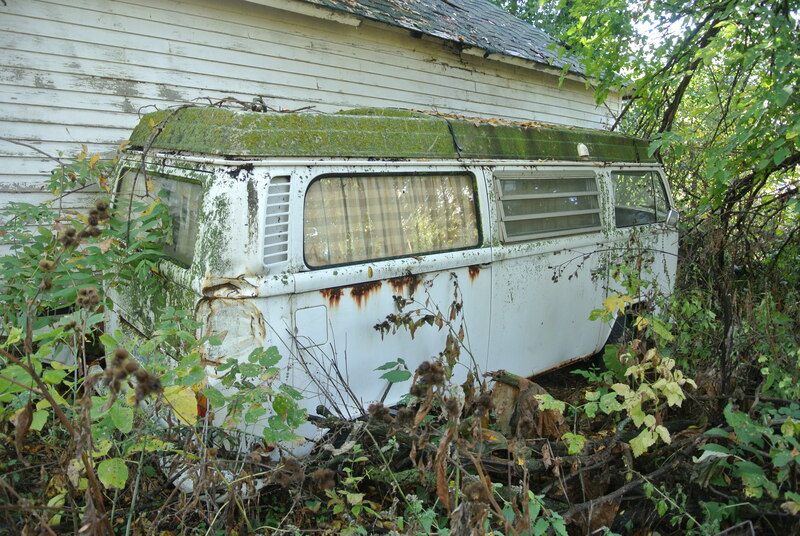 This congregation of the rusty iron cult was kinda picky though, this VW Westfalia camper went for $50! The followers of these “Westy” campers are a cult in themselves, and every little piece of that camper conversion is worth something to them, even if you have to take a few dead mice and a ton of rusty metal in the deal. It’s deals like this that tempt me to lay out the big $$$ for a diesel pickup and trailer… Haul her home, sell off the bits that’ll sell, then make your money AND fuel cost back scrappin’ the rusty hulk. Couple 80s vintage motorhomes didn’t fare much better, selling for a hair over $100. There was at least some love for an ’83 Dodge (Mitsubushi) 4 by 4 diesel pickup that got bid up to around $500, I suspect the auction stagers couldn’t find the battery in it’s under the bed hidin’ place and never knew if it would start. Running, this 30 MPG pickup is probably worth $4k… Or maybe the (un)lucky buyer paid way to much for scrap metal? Otherwise, an assortment of pickups and vans from the 50s to the 90s went for scrap prices, ‘cept for the Astro minivan that actually ran. The bigger tractors largely went for less than a thousand too, thought an Allis that ran went for $3k and a couple mere couple decades old mid sized 4 by 4 tractors did a bit better. So the rusty iron cult meets again, and a lot of rusty iron will get trailered from this collection of falling down (literally) sheds and groves to the next. The owner’s in a nursing home and don’t even know what’s goin’ on, family members tell me he bought most of this horde at auctions over the last few decades, hauled it home, and parked it to rot… Clearly a member in good standing of the rusty iron cult!